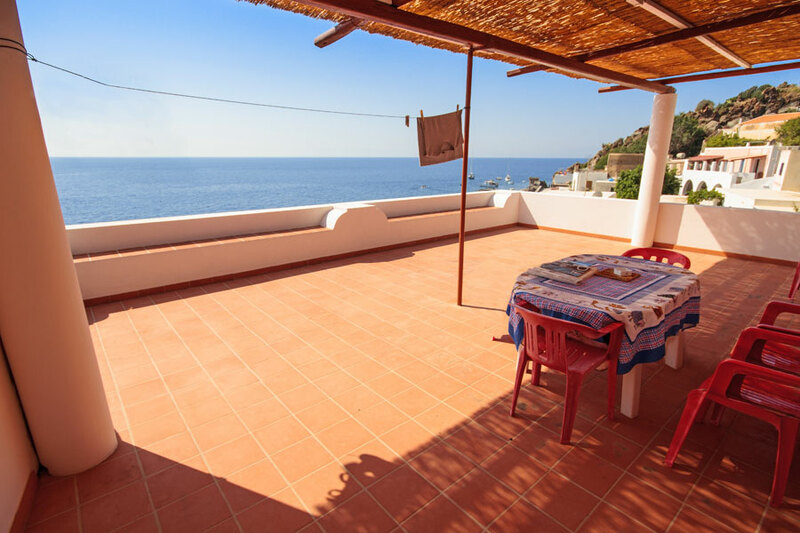 The island of Filicudi has two landing-places, Filicudi Porto and Pecorini Mare. The latter is currently not used by ferries and hydrofoils, due to unfinished work. 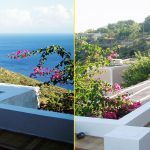 You will, therefore, arrive at Filicudi Porto, an attractive wide cove, dominated on the left (as you arrive) by Capo Graziano. A path takes you, in fifteen minutes, to the summit of Capo Graziano, a natural fortress, where the remains of a prehistoric village are visible. The site is fenced off and to visit it, you must enquire of the custodian at the port. The stone bases of the huts and the valuable pottery found there, now on show in the museum of Lipari, bear witness to the importance of the island since the Bronze Age. Capo Graziano gave its name to the Eolian culture of that period. Moreover, at Piano del Porto, a more ancient settlement has been found. Filicudi Porto is quite lively in summer and here you can find most of the services the island offers; the ferry and hydrofoil ticket offices (Liberty Lines, Siremar and Ustica Lines), the only tobacconist’s, the Farmacia , which sells jewellery, handicrafts and fashionable clothing. You will also find the restaurant Nino sul Mare, well-known for its spaghetti with lobster and ‘alla filicudara’ with capers, olives, anchovies and rosemary, the restaurant and wine-bar Hippocampus serving raw Mediterranean fish dishes and linguine with prawns and breadcrumbs, a supermarket Bonica. The Hotel Phenicusa***, to the right of the quay, is the biggest hotel with rooms overlooking the sea and a pebble beach. Following the paved road, and passing Capo Graziano, you arrive at Rocca di Ciaule, the central point of the island. There isn’t a single village on the island, but a series of small groups of houses with different names. 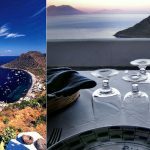 the Hotel Restaurant La Canna*** is a typical Eolian building in a panoramic position, overlooking the port and Capo Graziano. The spaghetti ‘alla carrettera’, pasta with broad beans and the sauce made with tomatoes ‘a scocca’, basil and paprika are all excellent. Ask Signor Pietro to let you taste his malmsey and the fruit from his garden. The guest house Villa La Rosa, known as Da Lucia, is a restaurant, bar, grocer’s, baker’s, pizzeria and even a discotheque: it is the meeting point of the island, both for tourists in the summer and the locals in winter. The specialities are: maccheroni with wild fennel and swordfish skewers with lemon leaves. Stefano will make you feel at home with his generosity and courtesy. From Rocca di Ciaule, the road continues to the right towards Lisco Valdichiesa and Portella, where it ends in a little square. 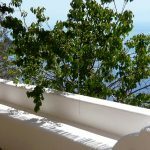 In this corner of Filicudi, overlooking the sea with lovely views, you are assured of coolness and peace, even in the middle of August. To the left the road passes through Canale, Pecorini Alto, Stimpagnato and finally, after a steep downhill stretch, reaches Pecorini Mare, which some humorists have defined as ‘the fashionable place for unfashionable people’. 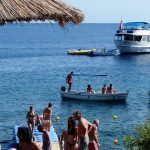 In the little square of this fishing hamlet there is the guest house and restaurant La Sirena famous for its swordfish roulades, grouper with green pepper, spaghetti with almonds or with ragù and orange. 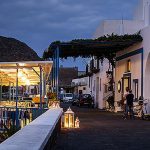 In this hamlet you can find the Delfini Diving Center, which also rents boats and mopeds, Marco Polo for boat rental, the shop Lino with its pottery, coloured beach wraps, wooden sculptures and handicrafts and the boutique Daniela with its handmade knitwear. If you are interested in underwater fishing, ask for Nino. Don’t miss the Saloon run by Zio Nino Triolo, for all the local gossip. At the end of the promenade, there is the restaurant Invidia which has a terrace overlooking the sea and offers spaghetti ‘allo scoglio’, fresh pasta with shellfish, linguine with lobster, mussels in pepper, granitas and home-made cakes. As well as the paved road, the island is criss-crossed by numerous ancient pathways, though not all of them are easy to follow nowadays. Here we suggest some simple and interesting itineraries. The walk begins in the little square at Rocca di Ciaule, preferably in the early morning, or at dusk. Next to ‘Villa la Rosa’ there is a chapel dedicated to Saint Stephen and, to the right, a small road which takes you to Valdichiesa in 20 minutes. You proceed along a path which climbs up among mastic trees, brooms, thorn apples and olive trees, with a sea view. At the first junction turn left and, at the second, right and you arrive at Valdichiesa. Here your attention is drawn by the Church of Saint Stephen, with its particular bell-tower which, years ago, was moved by an earth tremor. From Valdichiesa you can take a charming and easy walk to the abandoned village of Zucco Grande. Following the paved road towards Rocca di Ciaule, at the third bend, to the left, a wide track leads to Serro, where some caves have been turned into dwellings. Follow the road on the right hand side of the valley, moving then over to the left. Continuing straight on, halfway up the hillside, after 30/40 minutes of pleasant walking, the hilltop village of Zucco Grande, appears. It once housed 300 people. Almost all the houses have collapsed and been buried under the vegetation, trees grow in the houses and hold up the shaky walls. There is absolute silence, broken only by the croaking of crows which slowly glide on the currents of air. A path leads to the only water source of the island, the ‘fontanedda’ or better the trickle, given the poor flow of water. Alternatively, you can opt for a trip on a donkey, even to Zucco Grande.